Venture Capital Crunch or Not? 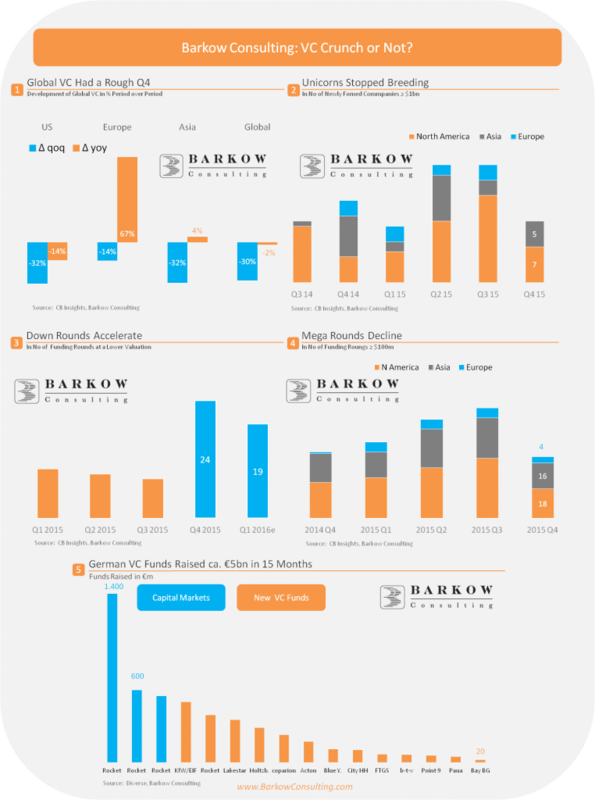 Tech Bubble, VC Crunch – or What? All in all this doesn’t read very well. And we have numerous US VCs sounding alarm bells (e. g. First Round, Y Combinator) too. US VC fundraising for startups seems indeed more difficult than in 2015. Nevertheless, individual comments at micro level seem worse than macro trend data. With the majority of global unicorns due to seek new funding around year end, we will probably have to wait until then to see, if and how bad things are and can get. Europe and especially Germany currently seem less impacted partly due to smaller deal sizes and earlier funding stages. It is, however, possible that things get trickier in Europe as well especially for larger deals.